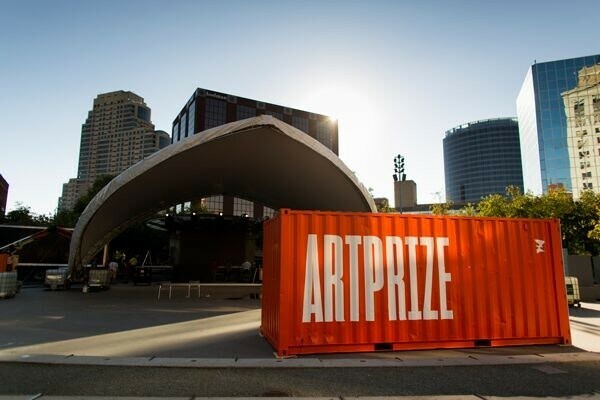 Blog > ArtPrize Newsletter: ArtPrize 10 is Here—Join Us For the Opening Ceremony! What Can I Do This Week (Sept. 19-21)? ArtPrize 10 officially opens TODAY! Over the next 19 days, discover something new, visit as many ArtPrize venues as possible, attend events at our new Visitor Pavilion at Rosa Parks Circle, and participate in a variety of free activities around town. Trust us, there's something for everyone. Start voting for your favorite entries at Noon today—Round 1 runs through Sat., Sept. 29 at Midnight. Join us in celebrating the kick off of ArtPrize 10 at 7:00 pm at Rosa Parks Circle. Experience the power of art + movement with ArtPrize+ Yoga @ WestSide ArtWalk, sponsored by Amway and Spectrum Health, and hosted by Funky Buddha Yoga Hothouse. Dive into the relationship of art + tech with OST. Ryan Swanson shares the secret behind his out-of-this-world installation. Gustavo Prado installs a sea of mirrors alongside La Grand Vitesse. Find out more about the official ArtPrize 10 beer, Trigo. This ArtPrize entry is smashing stereotypes of disability. See which 10 artists are featured at the GRAM. See what eye-catching art students are entering for the 2018 Youth Collaboration Award. Photo: The Visitor Pavilion at Rosa Parks Circle comes together with a saddle span tent and reimagined shipping containers. 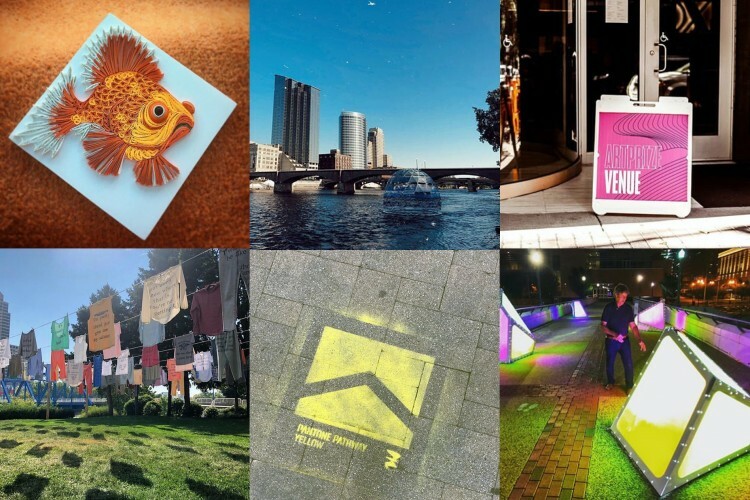 Bring your family and explore the city of Grand Rapids by registering for an ArtPrize GO Scavenger Hunt. Enjoy pop-up art making activities with repurposed materials by catching the ArtPrize Mobile Workshop. Join the John Ball Zoo at Rosa Parks Circle for an interactive family event featuring fun animal visitors! Hands-on activities and experiences will be happening throughout the day. Artists Creating Together welcomes youth and families to the Downtown Market for an impactful and unique creative experience known as Hungry for Art. Decorate to make a difference! Kids’ Food Basket Bag Coloring is a fun way to let your creativity thrive while adding adding a touch of love to sack suppers served to children in need. 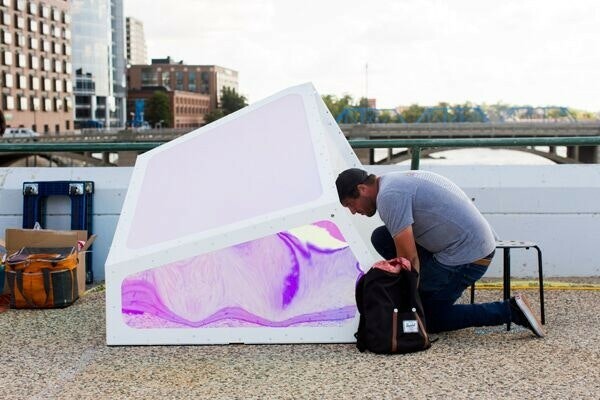 Photo: Ryan Swanson installing "Oscillation" at the Gillette Bridge. 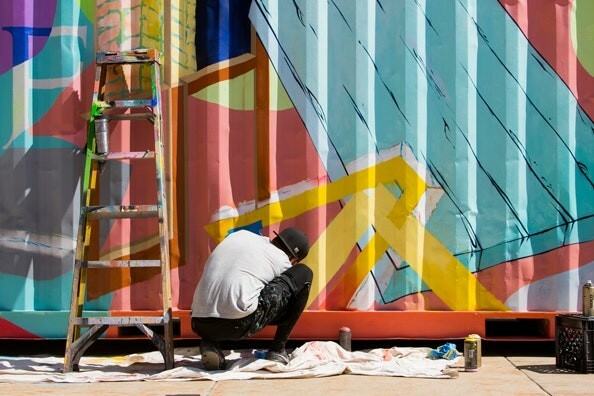 Photo: Brian Lacey intalling his shipping container mural at Calder Plaza.